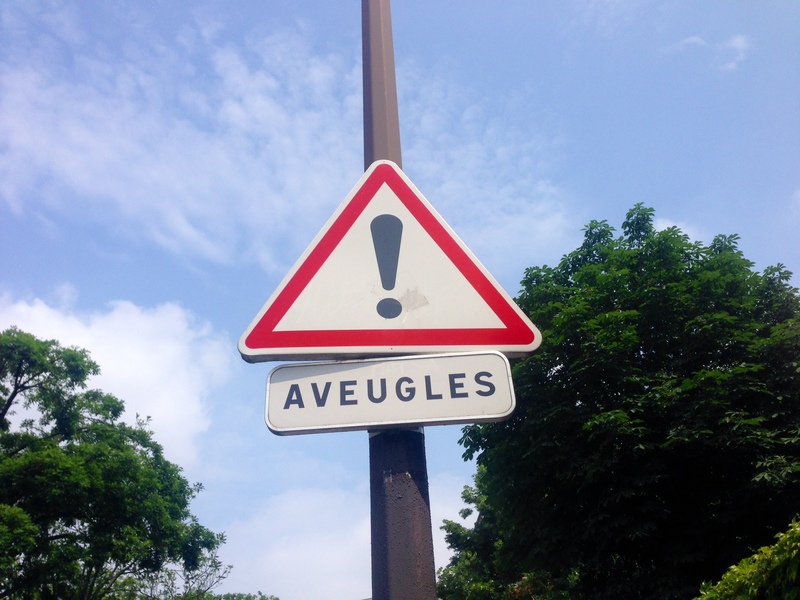 Dispatch from Paris: Beware of the Blind! Walking through the lobby of the Association Valentin Haüy, France's leading organization for helping blind people, I experienced a kind of whiplash. Paternalism looms so large that it's almost funny, until you realize that real people live and work with this every day. The second you walk in the door, you feel something sad and forgotten, people shuffling around as sighted helpers offer vague rays of hope to the afflicted. Right in front is a street sign that says it all: "beware of the blind!" Indeed! Yet it turns out blind people are HOT in France these days, at least when it comes to books. This is thanks to two recent mainstream publications, or actually three. One is a memoir by Jacques Semelin, a respected, super-productive blind historian, Je Veux Croire au soleil (I Want to Believe in the Sun). This is a follow-up to his critically acclaimed 2007 memoir, J'arrive où je suis étranger (Arriving at a Place Where I Am a Stranger). He's been making the rounds of France's top media, including television and radio programs. Lusseyran and Semelin come from a distinguished lineage of smart French blind men here and here and one remarkable blind woman. Remember too that Louis Braille, who invented the tactile language that bears his name, was French. Thanks to philosopher Denis Diderot's 1749 transformational Letter on the Blind for the Benefit of Those Who See, all of them came into a world where people thought the blind should be educated. Whether we realize it or not, today's blind Americans have more opportunities because of French writers. Amazingly, you can get all three of these books almost anywhere in France, including the airport, and it wouldn't be impossible to imagine asking the person at the counter to check in back for a copy of Diderot too. Even if it wasn't on sale, they'd likely know who you were talking about. Though the idea of blind people playing an important role anywhere in France is unthinkable, and we still have a ways to go in the US, I'm hopeful. Books such as these in France, along with the opening of San Francisco's LightHouse for the Blind and Visually Impaired's mind-blowing new facility designed by and for blindfolk (check out this blog post about the building by our Associate Director) will one day eclipse places like the dreary Association Valentin Haüy. It's already time to proclaim "Beware of the Blind!" not with shame but with pride.